Boil the pasta as per the packet instructions, drain and set aside. Heat 1 tablespoon of olive oil in a pan over medium heat, add in the mushrooms and cook for a minute. Add in the garlic and cook for a further 5 minutes. As soon as they are cooked, remove and add to the cooked pasta. In the same pan – fry the Quorn Vegan Hot and Spicy Burgers as per the packet instructions. Once cooked, set aside on paper towel to absorb excess oil. Cut into 4 pieces. In a small bowl mix together the capers, olives, chilies, garlic paste, white wine vinegar, basil leaves and 1 tablespoon of olive oil. 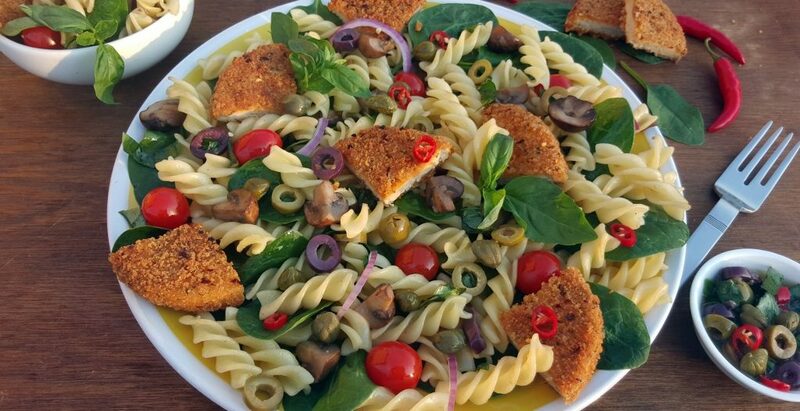 Add the tomatoes and baby spinach to the olives and caper dressing and gently mix with the pasta and mushrooms. Just before serving, add the pieces of Quorn Vegan Hot and Spicy Burgers.